When translations go wrong: a helping of lamb? Of all the translations that I have seen on Lanzarote that have gone wrong, this one has to be the worst. I think the original says “a typical dish from southern India with a helping of lamb in onion and black pepper sauce”. 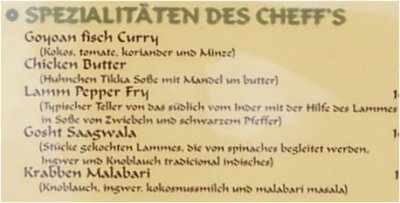 What it actually says, in German, is not really translatable back into English, but it comes out something like this: “a typical plate from the southern bit of the Indian (person) with assistance from the lamb in a sauce from onions and black pepper”. This looks like a typical computer translation – word for word ignoring the context of the text. So why do restaurants get away with this so much on Lanzarote? Do the tourist not care as long as it’s comprehensible? Do the restaurants not want to spend money on proper translations? If you have any ideas on this subject, please leave a comment! One of the problems with international translations is that you have to deal with words connected to places that don’t always have an obvious translation in every language. One example I had a few years ago was “Hong Kong Chinese” – I rang the German Embassy in London to ask them for advice! So what is something that comes from Lanzarote? Most English texts use “Lanzarotean” and the German equivalent would seem to be “Lanzarotisch”. One restaurant didn’t agree and used “Lanzarotenisch” which maybe sounds more exotic? Today the Monday Podcast discusses the translation errors that I have been blogging about for the past few weeks and discusses why such mistakes happen.